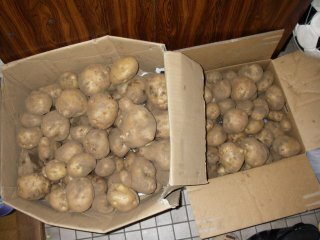 We got three boxes of potatoes!! I gave my neighbor some potatoes. Those look delicious. I like my potatoes, sliced and fried, or mashed or just baked in the oven. Or on the grill! You harvested all these? Wow. These potatoes look very fine and tasty. I will cook potatose salad. Yes, baked potatose are nicce too!! Dear Lucy, I think I'll share one of my best summer recipes for potato. Skin the potatoes and cut them to small 2-3cm cubes. You might start with garlic or can leave that out. When the oil is a bit hot, add potatoes, not all at the same time. Sauté potatoes and burn their sides a bit. when potatoes are halfway ready, add any vegetable you like. I like adding zucchinis, summer squashm celery sticks, green pepper, mushroom. Salt and season to your liking. When the mix is ready, add handfulls of freshly cut herbs. Serve with salads or with sour cream. That is an easy-to-make summer recipe. Thank you for recipes. I will try it. >Do you need salt or butter? Sure. Use salt as you wish. If you don't like the oil, you can use butter instead. >Do you use something spice? Those fresh herbs spice it up really good. By fresh herbs I mean, cause I usually use basil, lovage, parsley leaves, celeriac leaves, sage, oregano - whatever you have in the garden. Take a handful or two. Yes, you might feel that you have to add water. In practice, if you start sautéing the potatoes in oil (or butter) and later cover the pot, fresh potatoes will let out some water from themselves. So, there's no need to give extra water. But if you feel it's going to burn without water, than add water. Lucy, where did all these potatoes come from? Ah ha. I think the post below explains that one. Great picture of the field! One of my neightborhood is American. She was pleased about it. Hi Lucy, I'm visiting from Jay's place. I haven't looked at it very much yet, but I think you have such an interesting blog. How great to be able to go and harvest all those lovely potatoes. Nice meet you!! Thank you for comments of my blog. 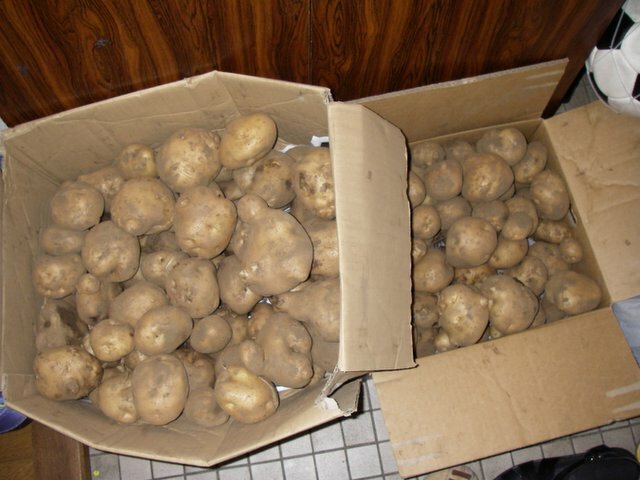 Now I have a lot of potatoes. And I have a lot of hats. But my hats are not cool... Just hat. Lucy - You are a wonder! I linked to you thru Jay's blog. I'm not smart or clever enough to try and blog in Japanese and I love that you're doing this and doing it so well. I'm enjoying your posts and pictures and feel like I'm in Japan as I read them. Thank you. Thank you for visiting my blog. My English is not good. Usually, I take mistakes something. But if you have a time, please visit my blog again. It's really hot and muggy here in Japan, isn't it! Wonderful potapoes! I usualy make a soup with leftover vegetables and POTATOES and bacon. You can eat it cool or hot. The both is good. By the way, one of your cats is Lucy!!! She is cute. Hello! Today, it is hot too. Szélső Fa and you told me "best summer recipes". I will cook try them.